Zeng Ho, or known as Cheng-Ho, a chinesse moslem admiral who also has Sam Po Yay Djien title, He served as a close confidant of the Yongle Emperor of China (reigned 1403–1424), the third emperor of the Ming Dynasty. Zheng He's ancestors include a general for Genghis Khan. Cheng Ho and his troops landed in Simongan Beach, Gedong Batu, Semarang, in 16th century. This place, Simongan in the past, was located near the beach area and can be reach by river boats. But now, this area is far away from beach land because of the land segmentations. This is the beginning of the Zeng Ho’s temple story. When it was statued first, there is just Cheng Ho’s temple as the main praying area. 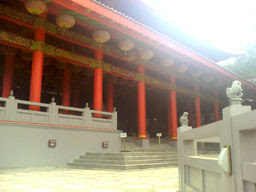 This temple was also used as together praying room between Cheng-Ho (moslem’s religion) and the other troops those believe in konfucius (kong-hu-chu) faith. This place suddenly became the aculturation place between Cheng-Ho’s armies and the local citizens. They get married and have sons with the local citizens there. Today, this Sam Po Kong temple, as the land of Cheng Ho armies get famous by name. 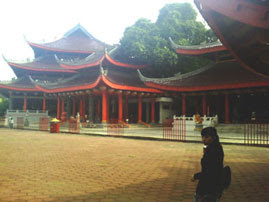 Besides of the praying place, Sam Po Kong also became one of the nice visiting place in Semarang. The statue, the temples, the building mass, and the open space, has been arranged in a good design. We can see a lot of acculturation between Chinese and Javanese in this place. Visitor can also rent the Chinese troops dress to take a memorability pictures there.